Enjoy blogs of our weddings, travels and tips on photography. The Oregon Coastline was an amazing backdrop for this impromptu creative session with Amanda and Matt at Cannon Beach between the Haystack rocks. A gorgeous girl in some gorgeous greenery! This venue always makes me forget I’m in Florida with it’s beautiful palm trees and lush florals. And hello, who isn’t obsessed with a cactus garden!? You have to see the simple and elegant outfit choices this senior chose for our session! Kayla and Jesse wed on the veranda at East Lake’s Country Club with a flowing backdrop of spanish moss gently swaying on a breathtaking oak tree at the entrance to the club. Their pale blue accents and abstract flower choices made their black tie wedding look stunning against the fervent greenery. This venue had an amazing and unique doorway to hang her dress that helped tie everything in this gallery together so well! As you look through the photos of their intimate ceremony, you will notice a theme in all of the photos; Carlye and Justin's contagious smiles. You will notice them especially whenever they look at one another. Audrey and Jonathan share a birthday and one of the most genuine loves I've ever witnessed! 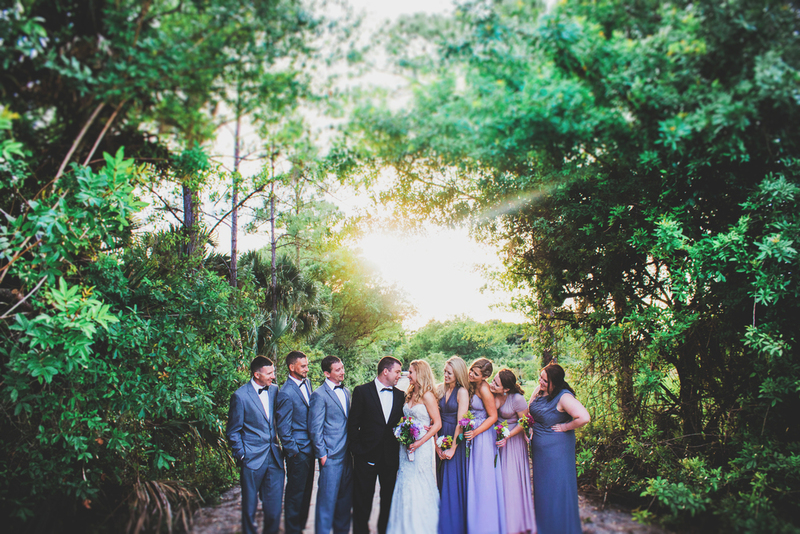 Click here to check out their gorgeous wedding day at the Westshore Yacht Club! A beautiful military wedding at the ornate Charles Ringling Mansion in Sarasota, Florida on the New College Campus. A gorgeous sunset and lots of romantic details made Rachel and Cole’s day a dream to photograph and be a part of. The bright green door is the staple of this venue and when Jen and Matthew exchanged vows under the beautiful green canopy covering the Manatee River Garden Club in Bradenton, Florida they knew they wanted a photo like this! Laura was so sweet and the two of them were so in love. I talked to them about their story before we began photographing and right away knew they were soul mates. Win FREE Photography for Your Bachelor/Bachelorette Party from Emily & Co. Photography! You could win a FREE bachelor/bachelorette party collection from Emily & Co. Photography!